The Montgomery 133 was clearcut in spring 2018.It was formerly a mature pine plantation, so it can easily be site prepared are replanted. There are several good places to create big food plots before you replant. Additionally, there is a two-acre strip of mature timber left alongside a streamside zone that runs through the tract. The tract is located in a Big Woods portion of the county, so it offers great turkey hunting with plenty of deer as well. The Montgomery 133 contains approximately 133.2 acres. It is entirely forested/cutover except for 0.5 acres in an electric powerline right-of-way. The property is located in a rural area that is largely forested with few residents. It is located about 12 miles southeast of Winona and 7 miles south of the Kilmichael community. 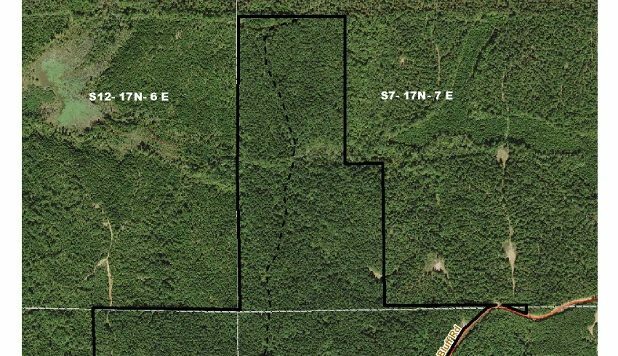 The property has good access, as the entire south boundary fronts the north side of Pine Bluff Road, which is gravel. The tract has about 0.8 miles of road frontage. Interior access is provided by two woods roads that run north from Pine Bluff Road. Pipe gates on these roads have the TimberCorp 4006 combination locks. The topography is hilly to steep, except for immediately adjacent to a small creek which crosses the northern third of the tract. Total elevation change is 100 feet and ranges from 350 to 450 feet above sea level. There are no ponds or other topographic features on the property (see Topo Map).